Last week was National Down Syndrome Awareness day - did you happen to hear about it? Do you know what Down Syndrome is? Do you know anyone with Down Syndrome? How have they impacted your life? Tell us below! Meanwhile, have a little read about Down Syndrome! 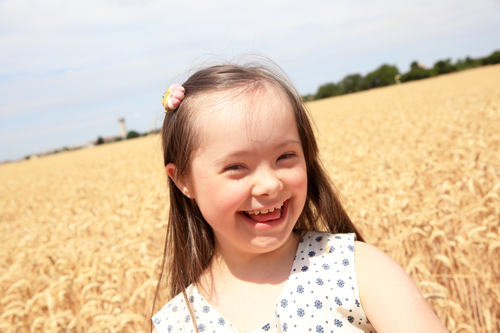 Down Syndrome is not a genetic disorder carried by the biological parents. It is usually caused by an error in cell division called nondisjunction. It is not known why it occurs. It is known however, that it is not related to anything the mother may have done during her pregnancy. It is important to remember that while children and adults with Down syndrome experience developmental delays, they also have many talents and gifts and should be given the opportunity and encouragement to develop them. Most children with Down syndrome have mild to moderate impairments but it is important to note that they are more like other children than they are different. Early Intervention services should be provided shortly after birth. These services should include physical, speech and developmental therapies. Most children attend their neighborhood schools, some in regular classes and others in special education classes. Some children have more significant needs and require a more specialized program. Many children with Down syndrome have health complications beyond the usual childhood illnesses. Approximately 40% of the children have congenital heart defects. - One in every 691 babies in the US are born with Down Syndrome, making it the most common chromosomal condition. - There are more than 400,000 people living with Down syndrome in the U.S.
- In 1983, the average life expectancy of a person with Down syndrome was a mere 25-years-old. Today, it's 60. - The likelihood of giving birth to a child with Down syndrome increases with maternal age, however, 80% of babies with Down syndrome are born to women under 35 years of age because this age group gives birth most frequently. - While behavior, mental ability, and physical development varies from person to person, many individuals with Down syndrome grow up to hold jobs, live independently, and enjoy normal recreational activities. So, if you are still unsure what Down Syndrome is, do some research, google it! Teach your children not to stare while out in public, teach them that there are others that are out there that physically look different, but they are like everyone else - wanting a full, fun and educational life - just like the rest of the population! And if you are still unsure or want to learn more, just ask! Family Watchdog has been adding resources to our list. It is ever-growing! If you would like to share helpful resources with us, please email us at C.s@familywatchdog.us!